An eReader lets travelers bring thousands of books with them on their journeys, but what if each of those stories was customized to wherever they happened to be at the moment? That’s the idea behind the Trip Book from a Brazilian loyalty program called Smiles that uses GPS to automatically change the location and landmarks in a story to wherever the reader is located. 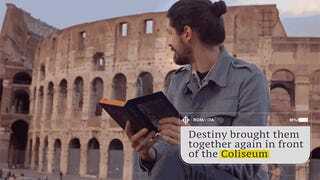 Created by ad agency FCB Brazil to help celebrate the loyalty program’s anniversary, the enhanced eReader features an interactive story written by author Marcelo Rubens Paiva specifically for the device. So it’s not like any eBook could be loaded and instantly customized to the reader’s locale—at least yet. Maybe one day when someone in Minnesota picks up A Tale of Two Cities it might actually be about Minneapolis and St. Paul. And don’t feel left out if you’re not in Brazil and can’t get your hands on the Trip Book Smiles. The story is also available as a free interactive eBook app for both iOS and Android devices which nearly all include GPS or basic location tracking functionality.